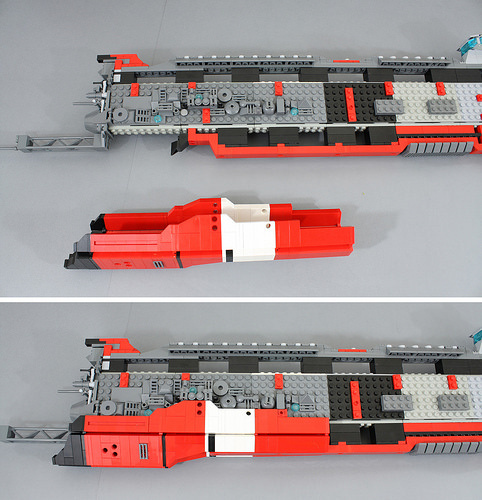 Tim Schwalfenberg worked on a massive Homeworld-inspired fleet of LEGO spaceships leading up to Brickworld Chicago last month, and we posted a couple of the great ships that make up the fleet, including the corvette and missile frigate. The full fleet is incredibly impressive, with the addition of a battleship and carrier. The carrier is worth a closer look in particular, with a red and white color scheme that ties it together with the rest of the fleet, along with a shock of yellow. Tim has incorporated some custom 3D-printed elements into the greebles. Can you spot them? 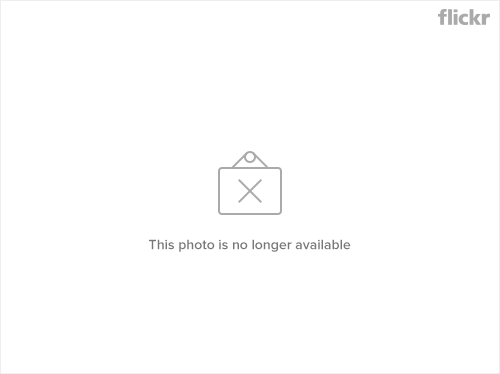 Tim hasn’t posted photos of his battleship yet, but we’ll bring that to you as well once he gets the photos online. Tim Schwalfenberg expands his Homeworld Vaygr fleet with this classy Vaygr missile frigate. It’s the second ship of Tim’s Vaygr fleet we’ve featured, after his excellent corvette, and Tim has more on the way to round out the armada. One of the best hallmarks of Homeworld-inspired spaceships is the clean color blocking, and Tim’s interpretation of the Vaygr fleet looks striking clad in white with red stripes. One of the best details is the missile launcher mounted on the side, a fantastic brick recreation of the original model’s detail. 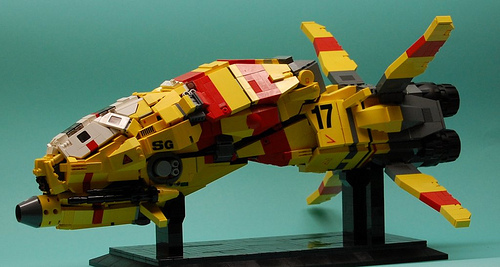 I’m not sure what’s going on this year, but we’re certainly seeing a lot of very large LEGO SHIPs in August (SHIPgust? Augtember?). Tim Schwalfenberg takes his inspiration from the venerable Homeworld PC game, with a super-detailed battlecruiser that’s easily one of my favorite SHIPs in several years. And at 140 studs long, Tim didn’t spare any length to achieve the shape and color blocking needed to achieve the distinctive look of the source material. Even though I’ve mainly been building military models over the last couple of years, I appreciate a good spaceship. And I’ve always been disappointed that I haven’t been able to play the iconic and influential Homeworld games. 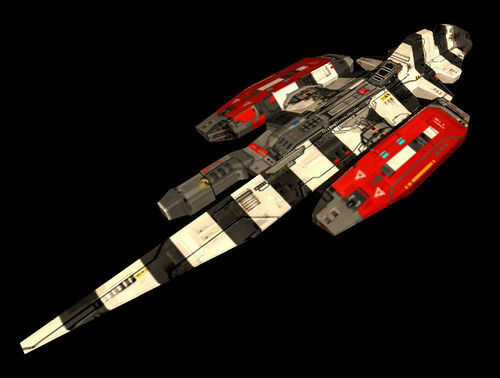 French builder Dorian Glacet has been playing Homeworld 2 lately, and built this great ship (actually a true SHIP at 105 studs long) with classic colors and stripes. Check out Dorian’s photostream on Flickr for more, including preliminary digital designs and work-in-progress shots. 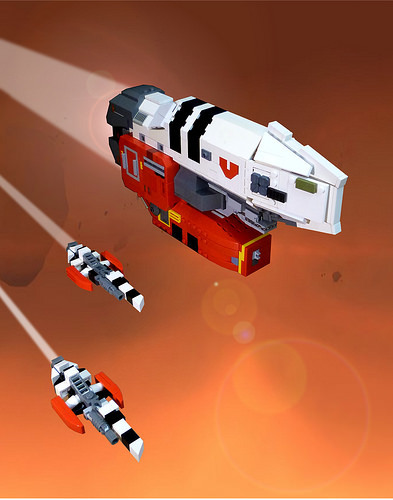 One of the biggest inspirations in the Lego space community has been Homeworld, the pair of fleet-building space RTS games from 1999 and 2003. With the gorgeous remastered editions released this past Wednesday, I don’t think there will be a better moment for a quick retrospective on how this incredible franchise has influenced builders over the past decade. 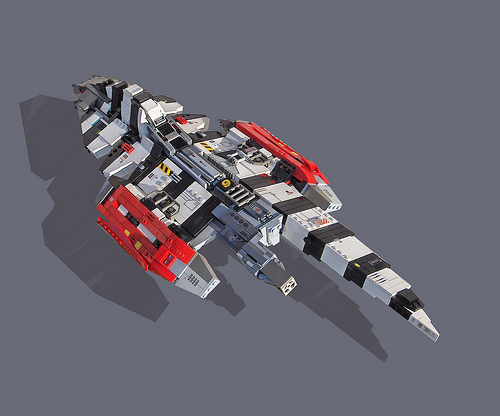 Danny Rice’s Porphyrion wasn’t the first Homeworld inspired build to be posted, but 9 years later it remains one of my all-time favorite MOCs. 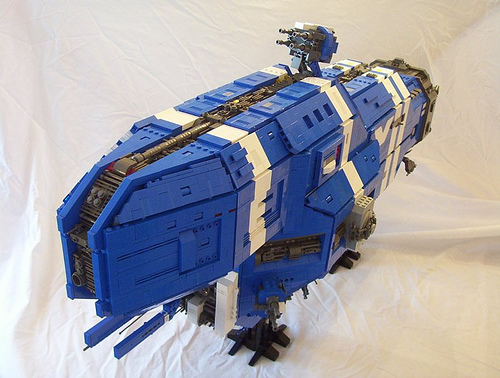 This masterpiece introduced a number of techniques that changed how SHIPs are built (particularly the use of paneling to create large angled hulls), and remains one of the best spaceships ever made out of Lego. Many of Rob M’s builds are based around a combination of Homeworld and Japanese model-building, resulting in a glorious fusion of clean hard angles and bright splashes of color. This reimagining of a Taiidan gunship is one of my favorites from him. Adrian Florea built this fantastically detailed recreation of a Vaygr bomber, using a wide variety of stickers and printed tiles to build what is perhaps one of the most faithful models ever made out of Lego. These are only a small sampling of my favorites; be sure to check out the Homeworld Lego pool to see more examples. Finally, a Lego Ideas project was just launched to have official sets produced from the Homeworld franchise, and I’d encourage everyone to support it – it’s a gorgeous game, and it’s directly responsible for pushing the frontier of space building.